WebSphere Process Server and WebSphere ESB are highly available and scalable products for running enterprise-level SOA solutions. But does every production topology that uses these products follow the same basic pattern? This book answers that question by providing guidance on how to select and build production topologies based on the applications that you deploy to that topology. It also helps you to discern which production topology is suitable for your environment and provides step-by-step guidance on how to build that topology. The intended audience of this book is IT architects and administrators. 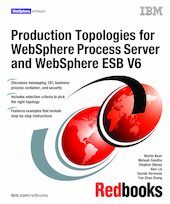 Part one of the book introduces some of the basic concepts and discusses three types of production topologies for WebSphere ESB and for WebSphere Process Server. It provides guidance on how to select the appropriate topology, discusses security considerations, and introduces the sample scenarios that we built for this book. Part two focuses on building production topologies for WebSphere ESB. Using sample applications, this part provides step-by-step instructions for building WebSphere ESB V6.0.2 production topologies. Part three uses a similar format but focuses on production topologies for WebSphere Process Server V6.0.2. This part includes step-by-step instructions on how to build a full support production topology that implements security.